This picture taken on Jan. 31, 2014, and released by the United Nations Relief and Works Agency for Palestine Refugees in the Near East (UNRWA), shows residents of the Palestinian camp of Yarmouk queuing to receive food supplies in Damascus, Syria. A UN official is calling on warring sides in Syria to allow aid workers to resume distribution of food and medicine in a besieged Palestinian district of Damascus. The call comes as U.N. Secretary General Ban Ki-Moon urged Syrian government to authorize more humanitarian staff to work inside the country, devastated by its 3-year-old conflict. In a photo released by the Russian state-owned news outlet, Sputnik, the body of the remains of a plane burned following the U.S. missile attack on Shayrat air base in Syria, April 7, 2017. 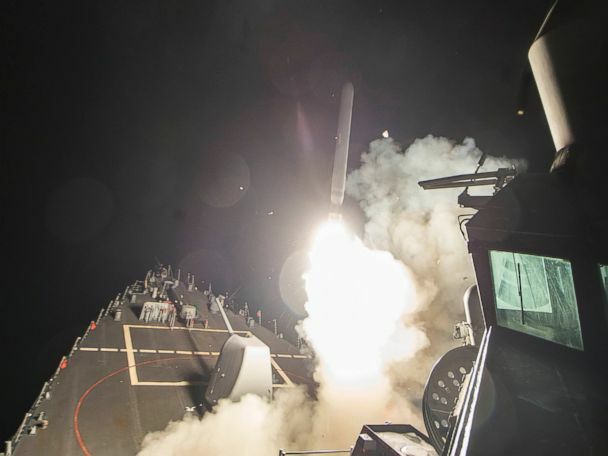 U.S. officials believe the plane that dropped chemical weapons on civilians in Idlib Province on Tuesday, which according to the Syrian Observatory for Human Rights killed 86 people, took off from the same air base. A man carries the body of a dead child after an apparent chemical attack in the town of Khan Sheikhoun in rebel-held Idlib, Syria, April 4, 2017. Syrian Mahmoud Al-Khatib, a fighter from a rebel group in Damascus province that fiercely opposes both the Syrian regime and the Islamic State group, holds a position inside a building on the front line in the town of Bilaliyah, east of the capital Damascus, on Feb. 4, 2017. Civilians walk through the rubble of destroyed buildings in the Syrian village of Kfar Jales, on the outskirts of Idlib, following air strikes by Syrian and Russian warplanes, Nov. 16, 2016. People peer through the wall of a damaged classroom at a school after it was hit in an airstrike in the village of Hass, in the south of Syria's rebel-held Idlib province on Oct. 26, 2016. Syrian men carrying babies make their way through the rubble of destroyed buildings following an airstrike on the rebel-held Salihin neighborhood of the northern city of Aleppo, on Sept. 11, 2016. Omran Daqneesh, a four-year-old Syrian boy covered in dust and blood, sits in an ambulance after being rescued from the rubble of a building hit by an air strike in the rebel-held Qaterji neighborhood of the northern Syrian city of Aleppo, Aug. 17, 2016. Images of Omran went viral and were shared thousands of times on social media. People gather around the rubble of a hospital supported by Doctors Without Borders near Maaret al-Numan, in Syria's northern province of Idlib, on Feb. 15, 2016, after the building was hit by suspected Russian air strikes. Syrians fleeing the northern embattled city of Aleppo wait on Feb. 6, 2016, near the city of Azaz, northern Syria, near the Turkish border crossing. Thousands of Syrians attempted to cross the Turkish border after the start of a Russian-backed regime offensive. Humanitarian aid supplies are strewn across the ground in the town of Orum al-Kubra on the western outskirts of the northern Syrian city of Aleppo, Sept. 20, 2016, the morning after a convoy delivering aid was hit by a deadly air strike. Smoke rises after Russian war crafts hit the Syrian rebel controlled town Daret Ezza in Aleppo, Syria on Oct. 13, 2015. A Syrian man receives treatment at a field hospital following an alleged chlorine gas attack by Assad regime forces in Jobar town of Damascus, Syria on July 30, 2015. A young boy walks past a barricade made from the wreckage of buses to obstruct the view of regime snipers, March 14, 2015, in the rebel-held side of the northern Syrian city of Aleppo. Residents queue up to receive humanitarian aid at the Palestinian refugee camp of Yarmouk, in Damascus, Syria, March 11, 2015. Syrian children are seen in a refugee camp near Atme, Syria on the border with Turkey, March 9, 2015. A young Syrian refugee is seen at an urban renewal area where the buildings were demolished in Istanbul, Turkey, March 1, 2015. A Syrian woman, who fled from her home in the Syrian city of Hama, now washes clothes outside her 5-square-meter hovel in the Turkish city of Hatay, Feb. 25, 2015. Syrians, who fled with their family of eight from Syrian city of Hama, are seen around a burning fire set in front of 5-square-meter hovel as they live in harsh conditions in cold winter time in the Turkish city of Hatay, Feb. 25, 2015. A Group of Syrian Kurds return to their hometown, Kobani, Syria, by the guidance of Turkish officials in Sanliurfa, Turkey, Feb. 25, 2015. Syrian refugees brave the cold and snow as they walk to a metro station in Istanbul, Feb. 11, 2015, at the start of a day's begging. Syrian refugees receive aid from the UN refugee agency (UNHCR)in Batroun, Lebanon, Jan. 13, 2015. A Kurdish Syrian refugee waits for transport during a sand storm on the Turkish-Syrian border near the southeastern town of Suruc in the Sanliurfa province of Turkey, Sept. 24, 2014. Syrians return to the Juret al-Shayah district of the central city of Homs on May 10, 2014, after the last Syrian rebels left the city's neighborhood under an evacuation deal that hands the government a symbolic victory. Syrian civilians return to their neighborhood in the old city of Homs, Syria on Friday, May 9, 2014, where bulldozers cleared rubble from the streets of battle-scarred districts in the central Syrian city after government troops entered the last rebel-held neighborhoods as part of an agreement that also granted opposition fighters safe exit from the city. A resident of the old city of Homs, Syria carries a photograph and a religious figurine after retrieving them on Friday, May 9, 2014. Two Syrian national flags hang on a pole as government officials inspect damages in the old city of Homs, Syria, May 8, 2014. Hundreds of exhausted Syrian rebels withdrew from their last remaining strongholds in the heart of Homs, surrendering the city to President Bashar Assad, once the center of the revolt against him. A photo of Syria's President Bashar al-Assad is seen along a street in old Homs city, May 8, 2014. Syrian forces say they will take full control over Homs, a city once vibrant with pro-democracy crowds but now associated with images of ruin that epitomise the brutality of Syria's civil war. Smoke rises from buildings after what activists said was shelling from forces loyal to Syria's President Bashar al-Assad in the besieged area of Homs, Syria on Jan. 15, 2014. Residents carry an injured man that survived shelling after what activists said was an air strike from forces loyal to Syria's President Bashar al-Assad in Takeek Al-Bab area of Aleppo on December 17, 2013. A young Syrian refugee carries a blanket next to a tent in a makeshift refugee camp in the Lebanese village of Qaraoun in the Bekaa Valley, on December 12, 2013. Syrian refugee women stand in line to receive their families share of winter aid kits at Zaatari refugee camp, near the Syrian border, in Mafraq, Jordan, Dec. 3, 2013. Residents run from a fire at a gasoline and oil shop in Aleppo's Bustan Al-Qasr neighborhood, Oct. 20, 2013, in Syria. 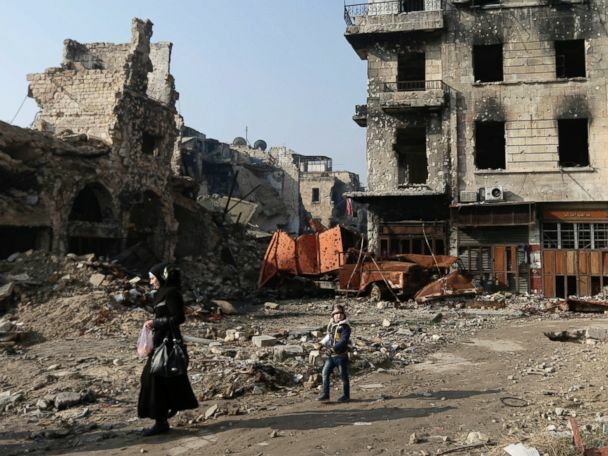 Witnesses said it was caused by a bullet fired by a sniper loyal to Syrian President Bashar al-Assad at the Karaj al-Hajez crossing, a passageway separating Aleppo's Bustan al-Qasr, which is under rebel control, and the Al-Masharqa neighborhood, an area controlled by the regime. In this Oct. 03, 2013 photo, sons of Mohammed Kale rebuild a house wall damaged by a mortar shell that landed days before at their family house in Kfar Lata, a ghost village at the top of a mountain subdued under heavy shelling and bombardments due the fighting between opposition fighters and government forces in the Idlib province countryside of Syria. A member of the 'Ansar Dimachk' Brigade, part of the 'Asood Allah' Brigade which operates under the Free Syrian Army, uses an iPad during preparations to fire a homemade mortar at one of the battlefronts in Jobar, Damascus, Syria on September 15, 2013. Rebel fighters duck as they run behind a barricade to avoid being fired at by Syrian regime forces in the Old City's front line in Aleppo on September 18, 2013. A man mourning over one among many dead bodies after an alleged poisonous gas attack fired by regime forces, according to activists, in Douma City, Damascus, Syria, Aug. 21, 2013. This Aug. 21, 2013, file image provided by by Shaam News Network, which has been authenticated based on its contents and other AP reporting, purports to show several bodies being buried during a funeral in a suburb of Damascus, Syria. Syrian refugees cross the border into the autonomous Kurdish region of northern Iraq, Aug. 17, 2013. Faced with brutal violence and soaring prices, thousands of Syrian Kurds have poured into Iraq's autonomous Kurdish region, seeking respite from fighting between Kurdish fighters and jihadists. A Syrian youth dives into a swimming pool as people enjoy a day out in the northern city of Aleppo, July 12, 2013. A Free Syrian Army fighter feeds a cat bread in the old city of Aleppo, Syria on Jan. 6, 2013. Dark clouds hang over buildings in Aleppo, Syria, Dec. 4, 2012. 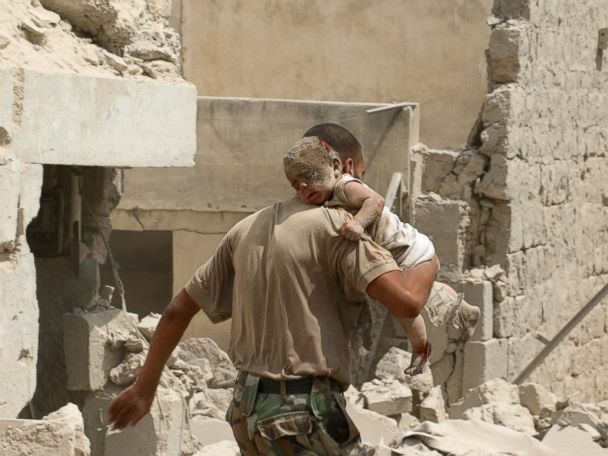 A father cries while holding his dead child in front of Dar al Shifa Hospital in Aleppo, Syria, Oct. 4, 2012. The Syrian Army has continued to shell Aleppo and claims Al-Sakhour district is now clear of mercenaries and terrorists. Syria youths react following an airstrike by Syrian government forces in Maaret al-Numaan Oct. 18, 2012. A masked opposition fighter poses inside the Shaar district police station in the northern Syrian city of Aleppo after it was overrun by Free Syrian Army forces on July 25, 2012. Syrian rebel fighter, Tawfiq Hassan, 23, a former butcher, poses for a picture, after returning from fighting against Syrian army forces in Aleppo, at a rebel headquarters in Marea on the outskirts of Aleppo city, Syria, Aug. 26, 2012. Syrians shout slogans during an anti-government demonstration after Friday prayers in the city of Binnish in Idlib province on June 29, 2012. Cars burn at the scene of two suicide bombs in al-Qazar residential area in Damascus, Syria, May 10, 2012. Syrian soldeirs celebrate in the al-Midan area in Damascus on July 20, 2012, Syria. Ahmed, center, mourns his father, Abdulaziz Abu Ahmed Khrer, who was killed by a Syrian Army sniper, during his funeral in Idlib, north Syria, March 8, 2012. Syrian mourners, one carrying the pre-Baath national flag adopted by the rebel movement, carry the body of a youth reportedly killed in violence in the northwestern Idlib region before his burial, Feb. 23, 2012. Three Syrian soldiers were killed and seven others wounded in a bomb at the southern entrance to the flashpoint city of Idlib , according to SANA news agency. Syrian rebels gather in front of the remains of a burnt military vehicle belonging to Syrian government forces destroyed by the rebels during clashes at Khaldiyeh neighborhood in Homs province, Syria on Feb. 23, 2012. Demonstrators hold portraits of Syrian President Bashar al-Assad, in front of the Syrian embassy in Sofia, in this April 17, 2011 file photo. Syrians hold up a giant Syrian flag during a pro-regime demonstration in the western residential Damascus suburb of Mezze, June 15, 2011, as embattled President Bashar al-Assad came under intense world pressure to halt a crackdown on democracy protests. Photos of children caught up in Syria's ongoing civil war.